The Court of Appeals has refused a request for a retrial in the case against four human rights workers and an election official who are being detained on corruption charges. The court also ordered that the defendants could remain in pre-trial detention for another six months to give the authorities time to conduct their ​i​nquiry. 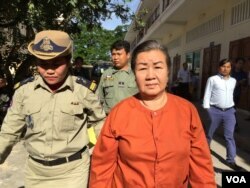 The five men are accused of bribing a woman so that she would not testify in a case against the deputy leader of Cambodia’s main opposition, Kem Sokha, who she was alleged to have had an affair with. Kea Sophal, defense lawyer, declined to comment on the details of the decision before having time to confer with colleagues. “The verdict to detain the defendants from the presiding judge is still valid because it is a criminal case and the investigation is not fully complete,” he said. The defendants could face up to ten years in prison if found guilty. The rights workers, from local NGO Adhoc, do not deny giving the woman, Khom Chandaraty, cash when they met her to discuss the case. But they claim that Chandaraty had asked for the money and that as she was a victim, the NGO’s policy allowed for modest support payments. 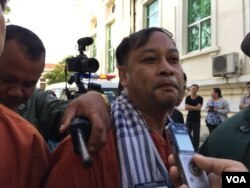 Mr. Nay Vanda, Adhoc's rights defender, was escorted by the security officers at the appeal court, Phnom Penh, on November 28, 2016.